From Pulp Obscura comes brand new adventures of one of the most unique heroes of Classic Pulp, now as a top quality audiobook produced by Radio Archives! A stranger with a glittering hook for a left hand. He came to the untamed wilderness of Africa to escape from a dark, troubled past to make his fortune. Yet his new life comes at an unexpected price. Wherever he goes adventure, danger, and death seems to follow... Armless O'Neil, explorer, adventurer, and soldier of fortune with his own unique view on life and a thirst for action like no other lives once more! In the Heart of the Dark Continent, the Man Known as Armless O'Neil Hunts for Legendary Treasures, but Discovers a World of Shadowy Secrets, Wild Danger, and Sensational Adventure! Thrill to Five Fantastic Stories of Savage Mystery, Amazing Action, and Incredible Excitement from Sean Taylor, Nick Ahlhelm, R. P. Steeves, I. A. Watson, and Chuck Miller! 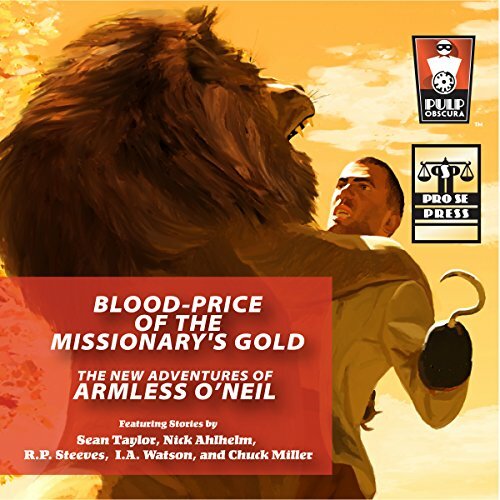 BLOOD-PRICE OF THE MISSIONARY’S GOLD: THE NEW ADVENTURES OF ARMLESS O’NEIL is available at Amazon and www.prose-press.com.